Buy Online Now! - Hilltop Hoods Rock Concert Posters and Memorabilia. Drinking from the Sun is their sixth studio album and was released in 2012. The album’s first single, “I Love It”, was released in 2011. The album debuted at number 1 on the Australian Albums Chart reaching gold status on its first day, making it Hilltop Hood’s third consecutive chart-topping album. The album is certified double platinum in Australia. 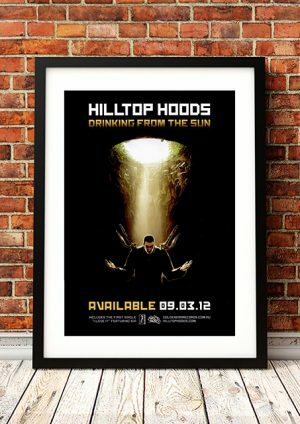 We stock a great range of Hilltop Hoods band concert posters.